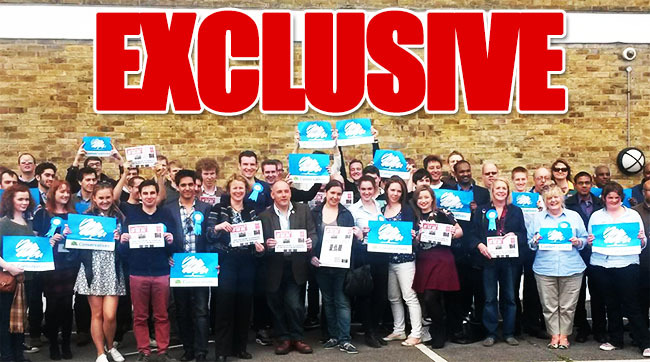 TheBlueGuerilla: Harlow Tory Campaign Day Goes Head-to-Head With Party Spring Conference. Harlow Tory Campaign Day Goes Head-to-Head With Party Spring Conference. HARLOW campaign day seems to have been a huge success as it went head-to-head with the Conservatives' Spring Conference this past Saturday. Hardworking activists turned up from far and wide to the Essex town where popular Tory MP Robert Halfon is defending a slimish 4925 majority, TBG can reveal. LOL @ Mahyar announcing a fake position on Facebook then having to take it down when Rebecca Harris told him it wasn't an actual position. LOL @ you not knowing the facts. Mahyar still has his position helping Rebecca Harris with CF in central office. He only took down the Facebook post after "you know who" panicked in fear of her own position in CF and trolled Rebecca's office! Even though Mahyar's role has got nothing to do with national exec's activities (regardless of the exec being inactive and incompetent). He was appointed to sort out the mess in CF. Can't stand Mahyar. Such an absolute buffoon. The second comment can only have come from the moron himself. "It has nothing to do with CF", yet "appointed to sort out the mess in CF". Idiot. @11:38 What did leyton do to lawton? Isn't leyton busy with his beer bottle?